This blog post was written by Ann Glacki, and was originally published in Past Forward – Wigan’s local history magazine. 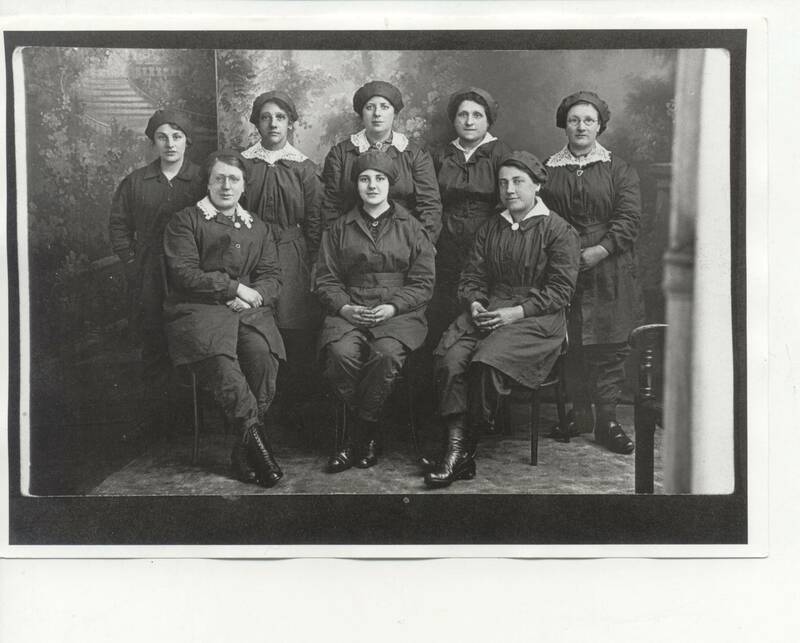 Munition workers, possibly from Bentley Ammunition manufacturing, c. 1916. As with many churches, there is a war memorial in the churchyard at St. Luke’s in Lowton. Last year, it was decided that we should commemorate those recorded there who gave their lives in the Great War by staging an exhibition. There are 37 names on the memorial, including one woman, Bertha McIntosh. The inclusion of a civilian on the war memorial intrigued me, and I wanted to find out what happened to her. It can be difficult enough to find out about the soldiers, who fought in the war as so many of the records were destroyed in the 1940 Blitz, but researching a civilian promised to be even more challenging. I found out that Bertha was born in Atherton in 1894. She worked as a cotton winder and in 1911 was living on Stonecross Lane in Lowton. When war broke out, she became a munitions worker at the National Filling Factory in Morecambe. Replacing men who had gone to fight with women was the only option, and over 700,000 women went to work in the factories producing explosives.Their popular name was munitionettes. Munitionettes worked with hazardous chemicals on a daily basis without adequate protection. Many women worked with trinitrotoluene (TNT), and prolonged exposure to the sulphuric acid that turned the women’s skin a yellow colour. The women whose skin was turned yellow were popularly called canary girls. Prolonged exposure to the chemicals also created serious health risks for the munitionettes. Exposure over a long period of time to chemicals such as TNT can cause severe harm to the immune system. People exposed to TNT can experience liver failure, anemia, and spleen enlargement; TNT can even affect women’s fertility. Bertha was one of those who died of poisoning, aged just 23. As if the risk of chemical poisoning was not enough, there was, obviously, the risk of explosions. In 1917, only a few months after her death, there was an explosion at the Morecambe factory where Bertha had worked, which put it out of action for the remainder of the war. The explosion at the National Filling Factory on White Lund was so strong its force was felt as far away as Burnley. Ten people were killed during the night the majority of whom were firemen. Fortunately, most of the factory workers were in the canteen on their supper break when the alarm was raised around 10.30pm which probably saved many other lives though in the rush to escape the site, some were injured. The biggest explosion occurred around 3am. manufacturing. Wigan Archives & Local Studies. Previous Previous post: Thoughts on the Sailors Fusiliers and Loyals Gallipoli Talk 2015.